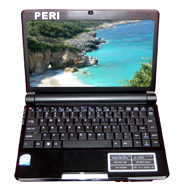 The all-new iBook from PERI offers the ultimate in portability, value and essentials you need for everyday computing needs. The lightweight, ultraportable device combines all the simplicity, quality and ease of use and has everything you need to stay connected, chat and manage your life on the move. The 10.1" display presents you with bright, clear imagery for a very enjoyable viewing experience, while a small-yet-powerful Intel Atom processor and large hard disk drive deliver the pleasure of full-size-notebook performance.